This week I had a chance to read a book called Flatlan: A Romance of Many Dimensions written by Edwin A. Abbot, first published in 1884. The book is thouched upon the relation between the different dimensions. 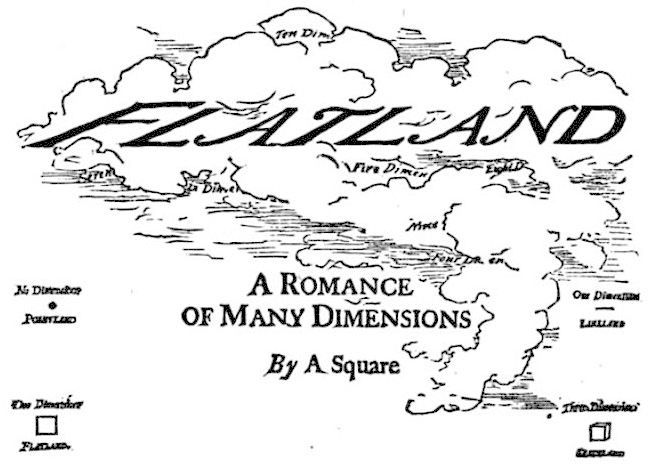 The story has mostly set in 2 dimensional world which is created by the author called Flatland. Citizens of Flatland are geometrical shapes. Moreover, these geometrical shapes characterized by a certain hierarchy and they are set according to their financial situation. The shapes that have higher number of the corners have more nobility than the others. For instance, isosceles triangles are soldiers, squares are businessmen, circles are the highest level such as priests and politicians. So that, it is obvious that the book is emphasizing the discrimination of people. Futhermore, the contorversial point is the women showed with the lines. Because women in the book have the less nobility and the worse financial situation. Even though, the book is telling about the two dimensional book, it bears the traces of the real three dimensional world issues. Another point that has arroused my attention was that the all shapes could see eachothers as a straight line. Because they live in a two dimensional world so that they could see only their one edge. The main character and the teller of the story is a square. One night he dreams that he visits the one dimensional world caled Lineland. In Lineland, only dots and lines are living. He meets with the tells them about two dimensional world and its features. However, they dont believe him because they live in a one dimensional world so it is hard to believe in two dimensional one for them. And try to kill this strange man. So he turns back to his own world. When he turns back his hexagon grandson tells his idea about three dimensional world. He alleges that if two dimensional squares come together they can form a three dimensional cube and three dimensional world exists. However, square does not believe in him. And then, a sphere from three dimensional world visits them. The sphere tries to tell about the three dimesnional world but they dont believe him so they try to kill him. But, sphere takes square to the his own world to show him the three dimension. Square couldnt believe in his eyes. He literally loves the three dimension and doesnt want to turn back to two dimension. However, because of that two dimension starts a war against three dimension. Because of the war square needed turn back to his own world. And they lock him down to the jail. As a conclusion, he claims that the fourth dimension exists. I think thats what the author is trying to claim. He is trying to defend that the fourth dimension exists. However, we can not experience them as three dimensions but fourth dimension can experience us. Like in the book, two dimensions can easily experience the one dimensional but one dimensions cannot experience the higher dimensions.